The Ministry of Foreign Affairs said Wednesday it expects tangible progress in North Korea’s complete denuclearization and the establishment of a permanent peace regime on the Korean Peninsula with follow-up efforts that will seek to overcome the setback in talks between Washington and Pyongyang in February. The announcement came as part of the ministry’s work plans for 2019, submitted to Cheong Wa Dae and the Office for the Government Policy Coordination late last month. “Based on the trust that the leaders of the US and North Korea have in our leader, we will play a leading role in the denuclearization process,” the ministry said. Keeping up the dialogue momentum between the US and North Korea is a crucial factor in making substantial progress, according to a high-ranking ministry official. “Diplomatic efforts will focus on facilitating a swift resumption of talks between the two countries,” the official said. US President Donald Trump and North Korean leader Kim Jong-un met in Vietnam for a second summit on Feb. 27 and 28. The meeting ended with no joint agreement due to differences over how much sanctions relief North Korea should receive in return for its limited nuclear disarmament steps. 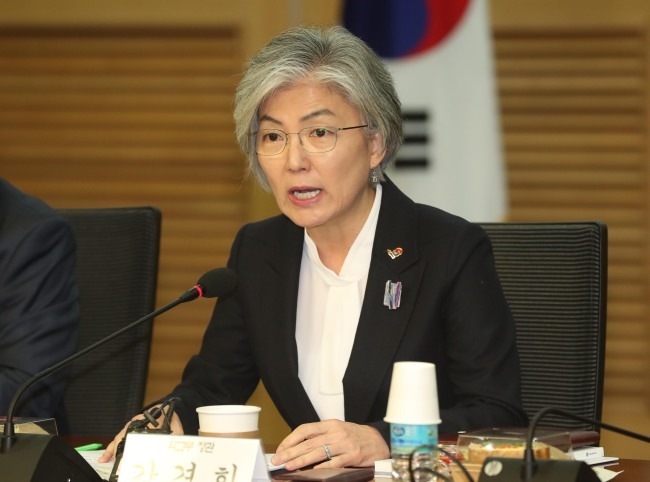 The ministry portrayed Seoul as a facilitator of the denuclearization process. To play the role, it will strengthen bilateral ties with the US government through high-level talks and other various diplomatic channels. Regarding the Kaesong industrial park and the Kumgangsan mountain resort tourism, two key inter-Korean economic projects the South Korean government wishes to resume soon, the ministry official said they remain Seoul’s priority but that it was “not appropriate” to comment on future plans for the projects for the time being. Apart from the issue of denuclearization, the ministry mapped out three other key policies for this year. To effectively manage rapidly growing demand for summit diplomacy, the prime minister will expand his role in attending diplomatic events on behalf of the president, who has been receiving an increasing number of requests for state visits and other events. The Foreign Ministry said it will “put in full gear its diplomatic diversification efforts by working more closely with the US, China, Japan and Russia.” It will also seek ways to take part in mini-multilateral and multilateral consultative mechanisms such as MIKTA, an informal consultation space launched in 2013 with Mexico, Indonesia, Turkey and Australia. The ministry said it will also beef up its system for the protection of overseas Koreans, render better assistance to Korean enterprises operating abroad and support Koreans looking for job opportunities overseas.